Visiting China with children and not going to Beijing would be wrong. Visiting Beijing and not going to see the Temple of Heaven would be silly. It seemed like a good idea to be in Beijing for the May 1st holiday until I went looking for accommodation. The YHA/Hosteling International hostel I’d chosen for us was full. All the hostels that had been recommended to us by other travelers were full. It was too late to change our flights, we needed somewhere to stay. I sat for an hour reading through descriptions of other budget hostels and hotels and eventually opted for the Emperor Guesthouse in the Qianmen area in central Beijing. The guesthouse was just OK but the staff were lovely and the central location was excellent for travelers getting their bearings in a new city. 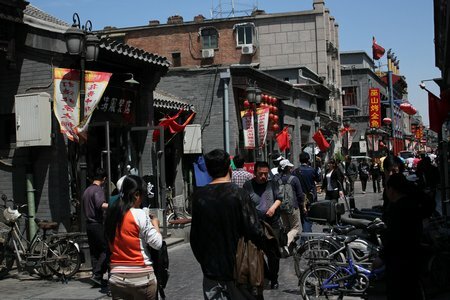 This was the view from outside our door: old-style hutong buildings and more tourist kitsch than anyone could ever need. It was a good place to start our visit to this, the third Imperial City we’d been in since leaving Seattle. For reasons we won’t go into (but which you can probably guess at if I say that we’d been at a party the night before) on our first full day in Beijing Murph and I were slow to start and not quite up to a full menu of sightseeing activities. I thought a walk to the Temple of Heaven would be enough to stretch CAM’s gangling teenage legs and allow us to mark at least one thing of our Beijing to-do list. We ambled down Qianmen St. which runs directly south from the Forbidden City to the Temple of Heaven. I told the kids that this was the way the emperor would have traveled when he went to the temple for official ceremonies. I recently read that when the emperor passed by the streets were hung with silk to hide any unsavory sights from his royal eyes. Now the buildings on Qianmen St. are sadly reconstructed retail units making it look and feel like pedestrianized shopping streets in other major cities. 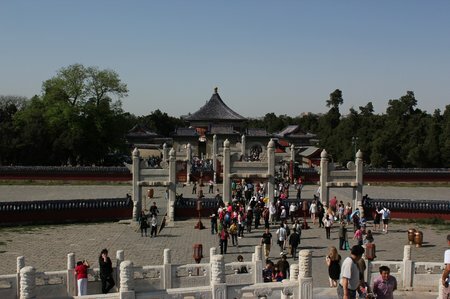 Our route led us into the Temple of Heaven from the west gate. There were few crowds and the fields of trees on either side made the whole place feel like a hideaway in the middle of the city. There wasn’t a patch of grass though, so the people we passed relaxing with their tea flasks were on blankets at the edge of the trees. We exchanged big “Hellos” and “Ni Haos” and lots of friendly smiles. I think they found us just as curious as we found their picnicking-without-any-space. It was a surprise when came around the wall of the Circular Mound Altar and walked into the visiting crowds. Oh! Obviously the western and lower park areas are not as popular with tourists. We joined the lines and walked up, down and around. We came out of the Imperial Vault of Heaven with a bunch of other tourists including a group of high-school boys – who looked and sounded as if they were from Dublin of all places. I was in front of my kids and when I turned around I noticed that a teacher was counting his charges to make sure he hadn’t lost anyone. “How come I’ve got an extra?” he exclaimed. One of the other boys pointed over at CAM who was standing with me. Obviously he’d been mistakenly counted into the group. The Hall of Prayer for Good Harvests is a truly beautiful building, looking even more perfect with a backdrop of sunshine and a cloudless blue sky. It would have been wrong not to take a snap for the family photo album. Don’t you think? 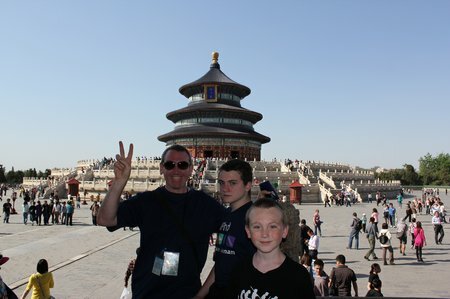 This entry was posted in China, International Escapades and tagged Beijing, China, China With Kids, Temple Of Heaven on May 25, 2011 by wandermom.